VIRGINIA BEACH, Va.–Water has long been something of a problem area for children on the spectrum. While the attraction to water can sometimes be dangerous for those with autism, other children on the spectrum can show symptoms of being downright terrified of water. That is why it is important for everyone to get acclimated to being in the water in a safe way. 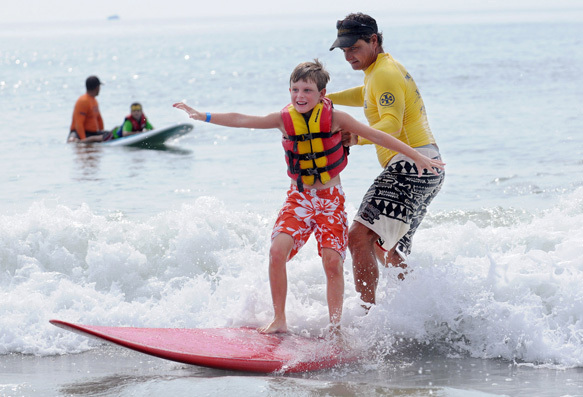 That’s where Surfer’s Healing comes in; a non-profit camp based in Virginia that aims to acclimate individuals with autism to water. Surfer’s Healing’s goal is to debunk previous notions about what children on the spectrum can and cannot do. By taking their campers out on the water, they encourage them to think past the limits society places on them, and to see the world. For individuals with autism, their daily lives can feel like an inundation of senses and stimulations. Phones, computers, television, traffic, and voices can be incredibly agitating and overwhelming. The Surfer’s Healing camp offers the campers a respite from this sensory overload, and to enjoy the calm rhythms of the ocean without other distractions. Surfer’s Healing camp runs Friday August 19th to Saturday August 20th, and though the camp is full, there is a 5K open to the public before the event.